What makes us want to live, or die? The Children Act is a portrait of the clash of the Legal vs Spiritual realms trying to resolve the everyday issues of Human Morality. This is a very intelligent and thought-provoking movie. 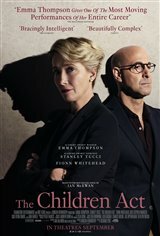 Emma Thompson's acting is incredible and deserving an Oscar nomination. Fionn Whitehead and Stanley Tucci give outstanding acting as well. One of the best movies of the year so far. A great film! This movie was very good for its acting. Emma Thompson was in great form. The point to this movie had to do with the judge learning something about herself through a connection made with a dying teenager. Her rigid behaviour may have served her career but not her personal life. Howard's End was riveting,nail biter with Hitchcock suspense compared to this thing. What is the point of this movie? Eraserhead had more depth. Disappointing and stupid movie. Love both actors but saw no point to the movie. I expected a court procedural about two challenging cases, each perhaps affecting the outcome of the other, but that's not what this story is about. In fact the conjoined twins case was only mentioned in passing at the start and never alluded to again. It's an interesting but rather slow observation of the interaction between the judge and the youth and the judge and her husband but not the intellectual legal drama I was looking forward to. There were too many close ups of Emma Thompson's facial affectations which I found somewhat distracting.